Be the first to share your favorite memory, photo or story of Margaret "Peggy". This memorial page is dedicated for family, friends and future generations to celebrate the life of their loved one. 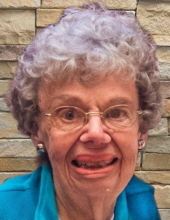 Pecatonica – Margaret “Peggy” Louise King, 86, formerly of Leaf River, loving wife, mother, grandmother and great-grandmother, passed away Sunday, January 27, 2019, at Pinecrest Manor in Mount Morris. Peggy was born June 4, 1932 in Argyle IL, the daughter of Harold and Edith (Ralston) Reid. She graduated from Harlem High School in 1950 and then worked at American Insurance in Rockford. Peggy married Donald Edwin King on June 18, 1955 at Willow Creek Presbyterian Church in Argyle by Reverend Lester Reemtsma. From a young age Peggy loved spending time outdoors on the farm, especially with the animals. She was a homemaker as well as a valuable partner in running the family farm. On any given day she could be found doing animal chores, field work, mowing, gardening, canning and freezing all types of vegetables. Peggy enjoyed a rich social life including luncheons with high school friends, called “the lunch bunch” and numerous card clubs, one of which met for over 60 years. A true horse lover, she enjoyed trail riding and raising foals and in later years she and Don spent their summers driving a team of ponies in many local parades. Peggy was a member of Seward Congregational Church being active on several committees and church circles. She was also a member of the local Grange, spent 15 years as a 4-H leader and was very involved with the Winnebago County Fair. Some of her fondest memories were made during WGN-led trips with Max Armstrong and fellow farmers all over the United States and Canada. A lifelong Cubs fan, Peggy was thrilled to see the Cubs win the World Series. Peggy is survived by her husband of 63 years, Don King of Pecatonica, sons Ron (Patti) King of German Valley, Jerry (Lori) King of Leaf River, granddaughters Amanda (Terry) Houser of Leonardville KS, Amelia (Josh Lower) King of Byron, step-grandson Travis (Caitlin) Roop of Arlington VA, step-granddaughters Heather (Joel Ross) Roop of Sandwich, Paige Roop of Raleigh NC, great-grandson Henry Houser, step-great-grandchildren Tatum Perry, Ryker Milam, Kylie Roop, sister-in-law June (Ralph) Grandle and two nieces Pat Grandle and Sue (Jay) Winkler. Peggy is predeceased by her parents. Visitation will be Sunday, February 3, 2019 from 1:00 pm to 4:00 pm at Genandt Funeral Home, 602 N Elida Street, Winnebago. Funeral services will be 11:00 am Monday, February 4, 2019 at Seward Congregational Church, 3029 S Pecatonica Road, Seward, with Pastor Joel Hicke officiating. Interment will be at Twelve Mile Grove Cemetery near Pecatonica. In lieu of flower a memorial will be established for Seward Congregational Church and Winnebago County Fair Association. For an online obituary and tributes go to www.genandtfuneralhome.com. "Email Address" would like to share the life celebration of Margaret "Peggy" Louise King. Click on the "link" to go to share a favorite memory or leave a condolence message for the family.